1) When cooking fresh apples for pies or sauces, the yield is about 50%. One pound raw apples equal 1/2 pound cooked. 2) Pie baking apples need to be flavorful, firm but not overly juicy, and should be able to "stay together" when cooked. Some eating apples are fine for pies. Some, like Red Delicious and Macintosh should be avoided. Grocery stores usually carry Granny Smith, Courtlands, Braeburn, Empire and Gala, which will all work well for cooking and baking. 3) Two things that can help when your apples seem to juicy after you cut them up for making an apple pie. First, when you spoon the apple mix into the pie plate, don't scoop out the juice at the bottom. Leave it there. Second, add an extra tablespoon of flour to the mix to absorb some of the moisture. 1) With the season for pears now well into spring. Red and Green Anjous remain available, as well as Bosc. 2) Supplies of other varieties may be scarce but you can look forward to them again next fall or late summer. 3) Red Anjous will gradually decline in supply as they are sold. Because Anjou and Bosc pears are the most prolifically produced varieties in the Northwest, they can be purchased as long as June. 4) With traditional spring produce now available ... rhubarb, asparagus, snap peas...think of adding fresh pears to a salad. Baked pears are a quick dinner dessert or breakfast fruit, and a pear rhubarb cobbler or crisp combines spring items with the fresh juicy flavors of Anjou and Bosc pears. 5) Pears Are Nutritious: Pears are loaded with dietary fiber, are good sources of potassium, and even with their abundant, naturally-sweet juices, average sized pears have only 100 calories. 6) Fresh pears should be included as one of your "Five A Day" fresh fruits and vegetables. 7) Always Ripen Pears: Pears are one of the unique kinds of fruits that ripen best off of the tree. If allowed to ripen before they are harvested, their smooth, delicate flesh often becomes 'gritty' with granules composed of cellulose, lignin and other organic material. Enjoy the full flavors and abundant juiciness of fresh pears by ripening them first. The easiest and best no-cook summer desserts are simple combinations of whipped cream and fruit. 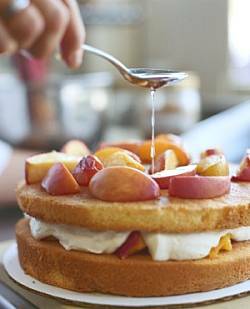 Rich, softly whipped cream is the perfect background for juicy berries, toothsome peaches, and sweet-tart mangoes. Add a complementary flavoring -- red wine, crystallized ginger, lime zest -- and you end up with a surprisingly sophisticated treat. I prefer to sweeten cream with confectioners' sugar rather than granulated sugar so that there's no unpleasant grit. A little vanilla extract added to the cream adds another flavor dimension. When possible, I buy organic, pasteurized cream (available in the organic section of my supermarket dairy department). I find that it whips up higher and tastes fresher than the easier-to-find ultra-pasteurized cream. Whipping cream is not difficult as long as you take care not to over-whip it. Beat with a handheld or standing mixer, just until it holds soft peaks. A minute and a half will probably do it. 1) Strawberries, Red Wine and Cream: Hulled and sliced strawberries soaked in a little dry red wine acquire a ruby-red glow and are wonderful when topped with a dollop of softly whipped cream. 2) Blackberry Fool: To make this simple dessert, combine blackberries with a little sugar in a bowl. Mash some, but not all, of the berries with a fork. Let stand and stir a couple of times, and then fold most of the juicy fruit into some whipped cream. Top each portion with some of the reserved "sauce". 3) Peaches with Ginger Cream: Peeled and sliced peaches are topped with whipped cream. Each portion is sprinkled with some chopped crystallized ginger to add some spice and crunch. 4) Pineapple with Lemon Cream: I like to mix whipped cream with a little sour cream and lemon zest for a slightly tart topping that contrasts nicely with sweet chunks of pineapple. 5) Rum-Sprinkled Mango with Cream: Slices of mango sprinkled with dark rum are set atop pillows of vanilla-flavored whipped cream for a no-cook dessert with a tropical flavor. 6) Plums, Cream and Brown Sugar: Brown sugar, with its subtle molasses flavor, is sprinkled on top of mounds of whipped cream and sliced plums for a wonderfully simple but surprisingly complex dessert. Simmer fruit juice, sugar and lemon juice in a heavy saucepan. Peel and core the pears and cut into slices. Place sliced pears into the poaching liquid. Simmer uncovered over low heat for 20 minutes or until pears are tender. You can cool this in the refrigerator and serve cold, or serve warm with a sprinkle of cinnamon or scoop of vanilla frozen yogurt. This dish can be cooked in the microwave except for the crowning touch, which is best done by hand. You can make this whole dish in about five minutes, and it looks marvelous. Melt the butter in a one-quart casserole. Roll the bananas in the butter and sprinkle with brown sugar and cinnamon. Microwave for 2 1/2 minutes on high or until the sugar begins to melt. Poor the liqueur and rum over the hot bananas. Ignite. When the flame dies down, serve over ice cream.